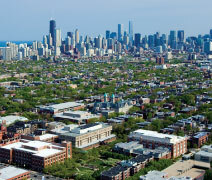 DePaul has eight traditional undergraduate colleges and schools based at two primary campuses in Chicago’s Loop and Lincoln Park neighborhoods. • The College of Science and Health offers innovative curricula and research opportunities with a dedicated focus on science and health paths. As part of DePaul’s alliance with Rosalind Franklin University of Medicine and Science, the newly launched Early Opportunity Program offers select students the opportunity for an early admission decision into one of six professional programs, including Pharmacy and Physical Therapy. • The College of Liberal Arts and Social Sciences offers a diverse range of opportunities for students, including Creative Writing, Public Policy, and Sociology. First-year students with certain LAS majors also have the opportunity to be admitted into the BA/JD program, where they become law school students after three years of undergraduate education. • The Driehaus College of Business is known for its top-ranked undergraduate Business program as well as its entrepreneurship expertise. The Princeton Review ranked DePaul in the top 25 of the country’s best academic institutions for undergraduate entrepreneurship education. • The College of Communication, located at the Loop Campus, is known for incorporating digital technologies throughout its curriculum, state-of-the-art facilities, and its partnership with DePaul’s Digital Cinema program. • The College of Computing and Digital Media, with one of the nation’s largest and most innovative Information Technology programs, includes leading courses in animation, computer science, and game design. • The College of Education is recognized for its success in preparing teachers for multicultural classrooms and its strategic partnerships with Chicago Public Schools, hospitals, and community agencies. • The School of Music is a premier program with distinguished faculty, including many members of the Chicago Symphony Orchestra and the Lyric Opera of Chicago. A new state-of-the-art music building opened in 2018. • The Theatre School is one of America’s oldest and most respected conservatory programs. It offers 12 highly structured majors with individualized attention to prepare students for practical experience in the world of theatre. In 2015, The Hollywood Reporter ranked The Theatre School as one of the top 25 drama schools in the world. DePaul University is the largest private Catholic institution in America, founded by the Vincentian order in 1898. It is an urban university reflecting a wide range of ethnic, religious, and economic backgrounds among its student body. Chicago; with its world-class theatre, music, and sports, this energizing city is an integral part of the educational, cultural, and social experience at DePaul. Ninety-eight percent of all undergraduate classes have fewer than 40 students. The student-faculty ratio is 15:1. 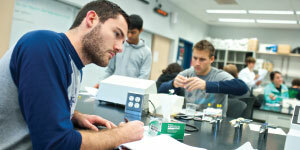 Faculty at DePaul focus on teaching, giving each student individualized attention. • In 2018, U.S. News & World Report ranked DePaul among the country’s best undergraduate Business programs. • In 2014, The Princeton Review recognized DePaul as one of the top 10 College Towns, the only Illinois college or university receiving that distinction. DePaul’s academic calendar operates on a quarter system. The three 10-week terms allow you to take fewer classes at a time but a greater variety of classes over the course of the year. * Summer Quarter is optional. The University Honors Program is an interdisciplinary curriculum that combines a rigorous liberal arts education with the cultural resources of Chicago. Supported by dedicated faculty and mentors, students in the program hone their critical-thinking skills, challenge themselves to excel academically, and deepen their self-knowledge. Admission to the University Honors Program is selective; students will be invited to apply upon admission to DePaul. DePaul’s many study abroad programs enable students to expand their world-view while living and learning in a foreign country for one or more quarters. Some options include Beijing, China; Budapest, Hungary; Istanbul, Turkey; Osaka, Japan; Paris, France; and Rome, Italy. And as a freshman, you can participate in first-year study abroad programs, which offer students the chance to travel to China, Ireland, Italy, Peru, Scotland, and many other countries. With more than 130 undergraduate programs of study (from majors and minors to concentrations and certificates), we’ve got the degree you’re looking for. For more information about specific programs offered by each college, go to go.depaul.edu/majors. With more than 350 groups on campus, student organizations are an integral part of student life at DePaul. NCAA Division I; the Blue Demons compete in the Big East Conference. DePaul University provides students with a nationally respected, hands-on education through personal attention, broad-based liberal studies, and an integrated service learning approach. More than 130 undergraduate programs combine practical experience with current theory, preparing students for immediate and long-term success. Located in the heart of Chicago, DePaul offers students unparalleled access to internships and learning opportunities with many of America’s top corporations and cultural institutions. Students build on those experiences through honors courses, service trips, and study abroad programs in over 30 countries. 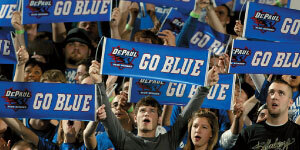 DePaul, the nation’s 13th-largest private university, is primarily a teaching institution. DePaul provides a highly interactive learning environment through expert instruction, small class sizes, and real-world projects. Ninety-eight percent of classes are taught by faculty members. The University is regularly recognized in publications such as The Princeton Review and U.S. News & World Report for the diversity and happiness of its student body. Outside the classroom, you have your choice of participating in any of the University’s 350 student organizations, ranging from sports and special interests to politics and pre-professional groups. You can join the Blue Crew and cheer on the Blue Demons as they compete in 15 sports in the highly competitive Big East Conference. And, of course, there’s Chicago, with renowned museums; world-class theatre, music, and sports; a wide range of great restaurants; and outdoor events in its many parks and on the lakefront. During the spring and summer, the city comes alive with fairs, concerts, tours, ethnic festivals, and outdoor fun. As a DePaul student, you’ll be connected to more than 180,000 alumni—116,000 in the Chicago metropolitan area alone—who form a vibrant network as they pursue careers, service, and lifelong learning. DePaul graduates can be found in all 50 states and approximately 80 countries. It’s time you found out more about DePaul. Visit depaul.edu.